Ever since Food Freedom Forever was released, I’ve been thrilled to see how the Whole30 community has embraced the idea that it is possible to build a healthy, intuitive, and sustainable relationship with food. Today, we’re sharing three videos that were filmed during a private event in Salt Lake City. During the event, I led a 90-minute discussion with 25 Whole30’ers about their health goals, challenges, and best strategies for creating and maintaining their own versions of food freedom. 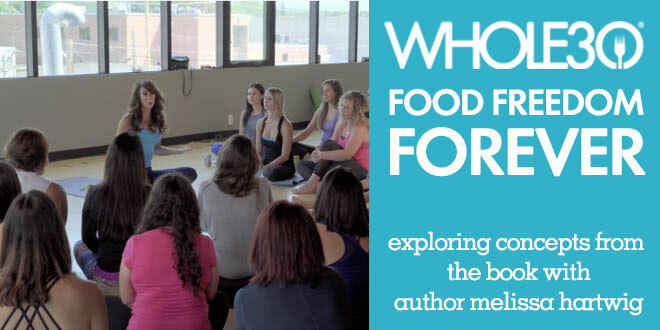 Think of these videos as an insider peek into Food Freedom Forever, as I share concepts and insights from the book with the group. No matter where you are in your food freedom journey, I hope these videos will motivate you to change your life through the groundbreaking 3-step approach outlined in the book. Video One: What is Food Freedom? On the #Whole30 blog: 3 videos with @melissahartwig_, sharing #Whole30FFF concepts.